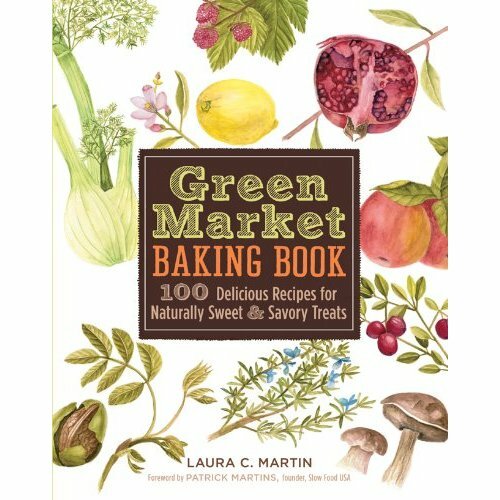 Do buy a copy of Laura C. Martin’s beautiful new book, “The Green Market Baking Book” recently published by Sterling. “It’s a book to devour,” as I offer as a quote on the back jacket. “There is something to learn, experience and marvel at on every page,” including Laura’s gorgeous full-color illustrations. They are the culinary equivalent of Audubon’s birds. Including 100 recipes — many of which are low fat, wheat-and-dairy free — the book’s guiding principle is that the sweeteners used are natural, and take the place of refined sugar, corn syrup, and artificial ingredients. These include honey, maple syrup, brown rice syrup, barley malt syrup, and agave nectar. Several are new to me. In addition to Laura’s original recipes (wait until you try her pecan pie and moist apple cake! ), are recipes from many of the best chefs and bakers in the business, including Alice Waters, Molly Stevens, Tom Douglas, and Dan Barber. When Laura reached out to many in the industry, everyone, including me, enthusiastically embraced her mission. Laura, who lives with her family in Atlanta, is passionate about locally grown, organically produced food, but when it came to desserts wanted to preserve the idea of wholesome eating by choosing sweeteners with integrity. So you will find sweet and savory recipes made with fruit, vegetables, nuts and grains that are as good for you as they are for the planet. Cookies with a conscience, so to speak. In addition to substitutions for refined sugar and corn syrup, there are substitutions for cow’s milk (soy, almond, rice milk); for eggs (mashed bananas, soft tofu applesauce, pumpkin puree or pureed prunes), and ideas for lowering fat and reducing calories with still-decadent results. Divided by seasons, this book creates immediate temptations. Winter includes recipes for Maple Sugar Angel Food Cake, Orange-scented Chocolate Cupcake with Chocolate Frosting, and a very nice Chocolate Honey Tart (with a whiff of lavender) — contributed by me! (you can find a version of this recipe in one of my blog posts.) Instead of the usual chocolate, however, Laura substituted grain-sweetened chocolate chips, which she uses exclusively throughout the book. pie (try using a new variety of apple) or her incredible pecan pie (she is from Georgia, after all). Merry Christmas! 2. In a mixing bowl, beat the eggs until frothy, then add the maple syrup and brown rice syrup. 3. Add the vanilla extract and salt. 4. Sauté the pecan pieces in butter in a large frying pan for 3 to 4 minutes, then allow to cool. 5. Add the cooled pecan mixture to the egg mixture and stir until all ingredients are well blended. 6. Pour into an unbaked pie shell. Bake for 25 to 30 minutes, or until set. 7. Serve with sweetened whipped cream. 2. Measure the olive oil in a glass measuring cup and pour into a large bowl. Use the same cup to measure the syrups. Add the vanilla, and mix until well blended. 3. Add the eggs one at a time, mixing well after each addition. 4. In a separate bowl, mix together the flour, baking soda, cinnamon, and salt. 5. Gradually add the dry ingredients to the wet mixture, mixing well but not overmixing. 6. Fold in the apples and nuts (and raisins if using). 7. Pour into a greased and floured 9×13-inch baking pan. Bake for at least 1 hour, until a toothpick inserted into the center comes out clean. 8. Leave the cake in the pan as you prepare the glaze. Melt the butter in a saucepan, then add the maple syrup and stir, cooking over low heat for 2 minutes. Stir in the cream and boil for 2 minutes, stirring constantly. Remove from the heat and allow to cool slightly. 9. Leave the cake in the pan and poke holes all over with a fork or skewer. Pour the slightly cooled glaze over the cake, making sure to distribute it evenly.